Below is a list of flying destinations near Boston that our members have recommended. Nearby airports with restaurants or cafes within a short flying distance of KBED are listed on the right. Our pilots love taking their friends and families up in the Cessna 182 or Cessna 206 for a bite to eat or to do some sightseeing. Be sure to call ahead to make sure they are open! If you have any recommendations please send them to Ted or Richard (rh_at_bluervdotcom). Boston City Tour, KBED (0 nm) - The Boston City Tour is great for passengers. Start North of the Needham towers. Call Boston approach (124.4) and ask for the city tour, going along the Charles River then turning north at I-93. They will usually allow you to do it at 2000 ft and will have you contact KBOS tower. Keene, NH, KEEN (50.4 nm) - Keene, NH has the Dinner Table Restaurant located just out the gate on the Northeast corner of the airport. Eclectic mix of American, Italian, and fried seafood. Brunch before noon on weekends. It is also great for building XC time as it is just over 50 nm from Hanscom Field. The foliage is great in the fall and Mt. Monadnock is impressive year-round. Newport, RI, KUUU (56 nm) - Nice area with bridges and mansions. Portland, ME, KPWM (82 nm) - Taxi into downtown Portland and the waterfront district and air museum are great destinations for visitors. Basin Harbor, VT, B06 (137 nm) - A little farther than most of the other destinations here, but great for a day trip. There is a restaurant (The Red Mill) on the manicured grass strip. You can also walk down to Lake Champlain to go swimming or rent kayaks or sailboats. A little out of the way, but be sure to fly over Fort Ticonderoga just south of 4B6. Bethel, ME, 0B1 (119nm) - Bethel Regional is right by Sunday River Ski Resort. Pack your skis for a day trip of skiing. There is a bus that picks up near the airport and goes up to the slopes. Block Island, RI, KBID (79 nm) - Block Island is old, quaint, and not quite as popular with tourists as Martha's Vineyard and Nantucket. A taxi will take you on a short round-the-island tour. Can also walk or bike into town from the airport. Katama, MA, 1B2 ( 75 nm) - Katama Airpark, on Martha's Vineyard, is a great beach destination. You can park at the southern end of the field and walk across the road to the beach. Be sure to stop by the main building to pay the parking fee and get some ice cream or food at the cafe. KMVY is a better choice if the weather is bad. Click here for an info sheet on Katama Airpark, no guarantees on currentness. Kingston, NY, 20N (123 nm) - Short cab ride from Kingston to the Old Rhinebeck Aerodrome. They put on a fun, family friendly show with some amazing antique aircraft and great flying. The museum is interesting as well. Lewiston, ME, KLEW (104 nm) - Grab the crew car from Auburn/Lewiston and go apple picking at Thompson's Orchard. Martha's Vineyard, MA, MVY ( 71 nm) - There is a cafe at the airport which has good breakfast and you can take a bus or taxi into the towns. Nantucket, MA, KACK (91 nm) - Nantucket is a beautiful island to visit. The airport is located in the center of the island and from there you can get a bus or taxi into downtown. From downtown you can walk down N Beach St to Jetties Beach. The island is also great for riding bikes, which fit easily into the Cessna 206. Provincetown, MA, KPVC (53 nm) - Provincetown airport is right on the beach. It has a very cool approach right over the dunes. From the airport you can take a bus or taxi into town. Rockland, ME, KRKD (135 nm) - The Owls Head Transportation Museum is located at the Knox County Airport in Maine. Rockland and Camden, nearby, are quaint Maine coastal towns worth visiting. Sugarloaf, ME, B21 (164 nm) - A little bit farther than Sunday River, Sugarloaf Ski Resort is right by the Sugarloaf airport. Call the resort for a pickup from the airport. The distance is just right to make this a day-trip. Hampton, NH, 7B3 (36 nm) - Hampton Airfield is what an airport should be, with a great cafe for breakfast and lunch. The deck is great during the summer to watch the planes takeoff and land with room for kids to run around and experience aviation. Also a great place to get a tailwheel endorsement in a J-3 cub. Jaffrey, NH, KAFN (37 nm) - Just by the airport road is Kimball Farms, which serves ice cream and hamburgers. Just follow the ice cream cones painted on the ground (after Columbus Day, call ahead to make sure ice-cream store and restaurant are open – they close down in winter). Fall foliage, old New England villages, and old stone-fence outlines revealed by changing colors of deciduous trees make trip up and back interesting. Lawrence, MA, KLWM (16 nm) - Joe's Cafe located in the terminal building. 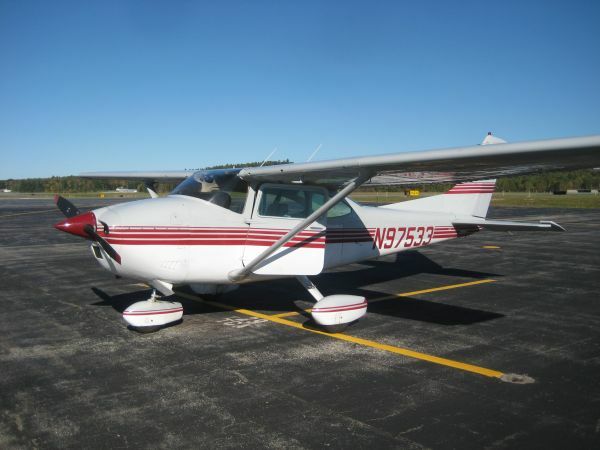 Nashua, NH, KASH (21 nm) - Nashua has a classic airport cafe, The Midfield Cafe, on the 2nd floor overlooking the runway, open for breakfast and lunch. New Bedford, MA, KEWB (50 nm) - "Intimate upscale American bistro" located in the airport terminal. One of the best on-airport restaurants out there. Stowe, MA, 6B6 (10 nm) - Nancy's Air Field Cafe at Minute Man airport is a delicious restaurant for breakfast, lunch, or dinner with truly fine cuisine by any standard. The airport also has very affordable AvGas and is a common filling up point for API pilots. Northampton, MA, 7B2 (59 nm) - Northampton is a quaint college town with lots of good places to eat. The center of town is about a mile walk from the airport, or you can call a cab. Plymouth, MA, KPYM (42 nm) - Plane jane's, a small cafe at the airport overlooking the runways. Keene, NH, KEEN (50.4 nm) - Keene, NH has the Dinner Table Restaurant located just out the gate on the Northeast corner of the airport. Eclectic mix of American, Italian, and fried seafood. Brunch before noon on weekends.